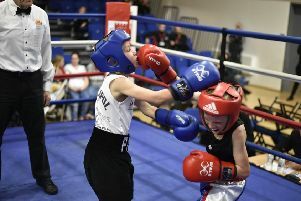 Cello Renda (right) in action against Tom Doran in the Prizefighter final in February. Cello Renda is hoping for a British-title shot - after picking a fight on Twitter. The 30 year-old from Peterborough sent a tweet to British middleweight champion Nick Blackwell, asking about the possibility of a fight between them. Boxing bosses meet next Wednesday (August 12) and could order Blackwell to defend his title against a mandatory challenger. But if not, there’s a chance the British Boxing Board of Control would sanction a voluntary defence for Blackwell against Renda. Renda’s credentials compare favourably with Damon Jones, the 14-fight novice beaten in six rounds by Blackwell a couple of weeks ago. He’s twice reached a ‘Prizefighter’ final, had previously won a British-title eliminator and twice challenged for English honours. For TV bosses - Blackwell is promoted by Mick Hennessy and his shows are shown on Channel Five - Renda is a hit-or-be-hit fans’ favourite who guarantees excitement. Renda, who’s training full time again after breaking a bone in his hand on the way to a ‘Prizefighter’ final in Blackpool in February, said: “Let’s get it on! The fans would definitely love to see me fight Blackwell. There were lots of comments on Twitter saying what a good fight it would be after I put the tweet out there. “Everyone knows the way I fight. Either I knock you out - or you knock me out. I don’t really do points decisions! “It would be a great fight, Nick seems keen and let’s hope we can sort something out. “I don’t really want to fight journeymen any more. I need fights against people in the top 10 to get my juices flowing - and the British title has been my target since I turned professional 11 years ago. Renda did think he was going to face Joe Mullender in an English-title eliminator in Bethnal Green on Saturday, September 5. Peterborough cruiserweight Karl Wheeler makes his return after a year out with a knee injury on the show and Renda was set to face Mullender over 10 rounds. He said: “They offered me the fight, I took it, then it all went a bit quiet and when we contacted them again they said the fight wasn’t happening any more. Renda is also looking back to his best having ended Jack Arnfield’s unbeaten record on the way to the ‘Prizefighter’ final in February.